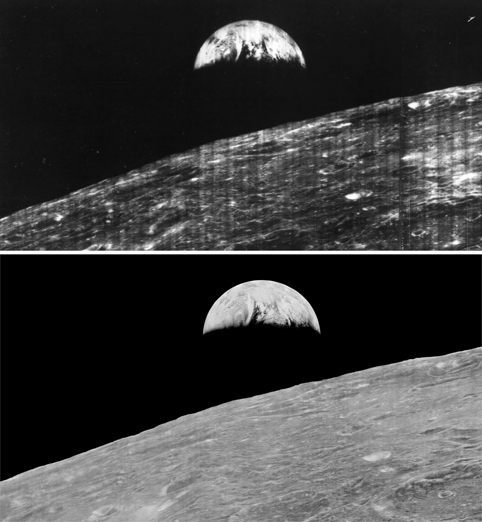 Keith’s note: 48 Years ago today, on 23 August 1966, Lunar Orbiter 1 snapped the first photo of Earth as seen from lunar orbit (Larger view). While a remarkable image at the time, the full resolution of the image was never retrieved from the data stored from the mission. In 2008, this earthrise image was restored by the Lunar Orbiter Image Recovery Project at NASA Ames Research Center. We obtained the original data tapes from the mission (the last surviving set) and restored original FR-900 tape drives to operational condition using both 60s era parts and modern electronics. The following links provide background on the image, its restoration, and reactions to its release. Here is a comparison of the full image in its original, familiar context (higher res)(print quality). You can download a 1.2 GB version from NASA here. Note: this is a very large file.